This is the first time we had ever sat on the toilet and had our lunch! Can you imagine a restaurant where the food is served in dishes that look toilets, bathtubs, and sinks? The Modern Toilet Restaurant is located on Yi Chung Street near the National Taichung First Senior High School. There are many restaurants in this area, but this one is really special! When we first went into the Modern Toilet Restaurant, we saw a room that looked like a restroom! Toilets, sinks, and a lot of colorful fake poopoo scattered here and there. 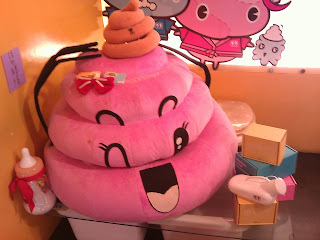 Although the manager uses toilets and the colorful fake poopoo to decorate the restaurant, we didn’t feel the decorations were disgusting; we thought the decorations were very cute! Our waiter led us to our seats. What a surprise! We sat on toilets and used a big sink as a table! The toilets and sinks in the restaurant are white, and the toilet lids are decorated with different designs by the manager. I thought that the toilets were beautiful and special because no other restaurant uses toilets as chairs. The light in the restaurant was bright, and the music was comfortable and relaxing. The Modern Toilet Restaurant sells many kinds of dishes, including spaghetti, hot pot, au gratin, pizza, snacks, shaved ice, and drinks. If you order spaghetti, hot pot, or au gratin, you will get a soda and an ice cream at no extra cost. The names of the shaved ice desserts are all disgusting and special. 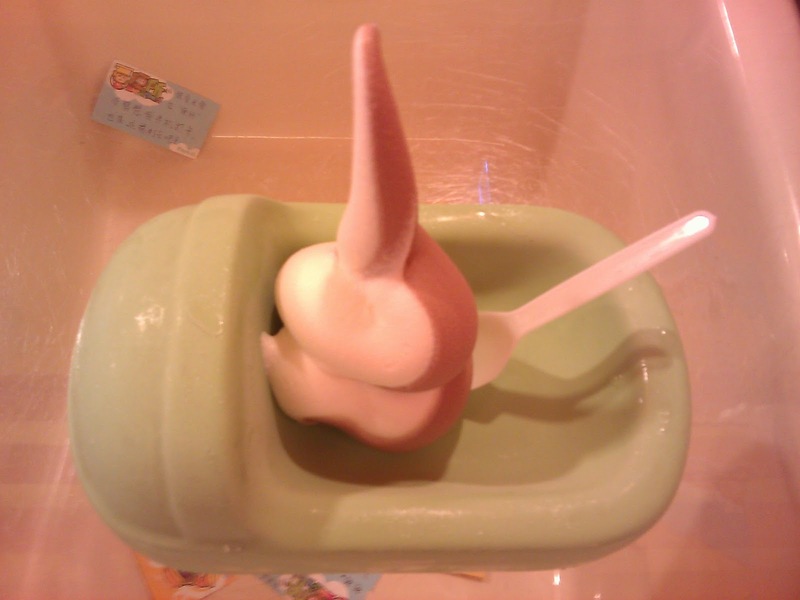 For example, a shaved ice with chocolate flavor is called “diarrhea” and the strawberry jam on the shaved ice is described as “bloody stool”. We ordered three dishes; one was smoked chicken and cream sauce spaghetti; the second was seafood with tomato sauce au grain, and the last was margarita pizza. The smoked chicken and cream sauce spaghetti were served in small sinks. 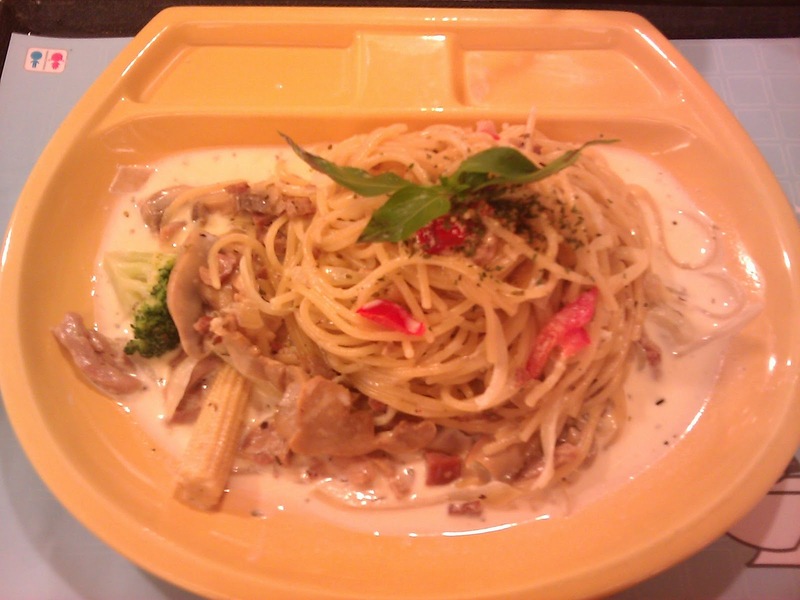 I thought that the spaghetti was tasty because the dish had a rich, heavy cream flavor and there were mushrooms around the spaghetti. 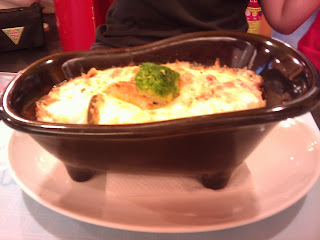 The seafood with tomato sauce au grain was served in a bathtub. The food was very hot, and the shrimps and clams were big and fresh. In contrast, the margarita pizza was a simple dish. The ingredients included tomato ketchup, cheese, and basil. It tasted not as good as other dishes because the flavor of the tomato ketchup was so strong, and the pizza tasted boring. The waiters and waitress in the restaurant were friendly, and they introduced their menu when we started to order. If you can accept the idea of eating out of a toilet, you will like the Modern Toilet Restaurant. Now, the restaurant has a special deal for students. Monday though Friday, if you use your student ID card and order both spaghetti and pizza, you will get 21% off! We recommend that you try it.